New year, new company, new market? Maybe. . . Or maybe you just want to know how to be as successful as a top competitor. Either way, let's get into it. First and foremost, what is First Mover Advantage? First mover advantage is when a business is the first to see reputable success when entering a new marketplace by offering a unique product or service. But, why should you care about first mover advantage, especially since your business is probably already established? Well, If you look at how previous companies have seen success, either if they're first movers or followers in a marketplace, you can unveil similar opportunity. 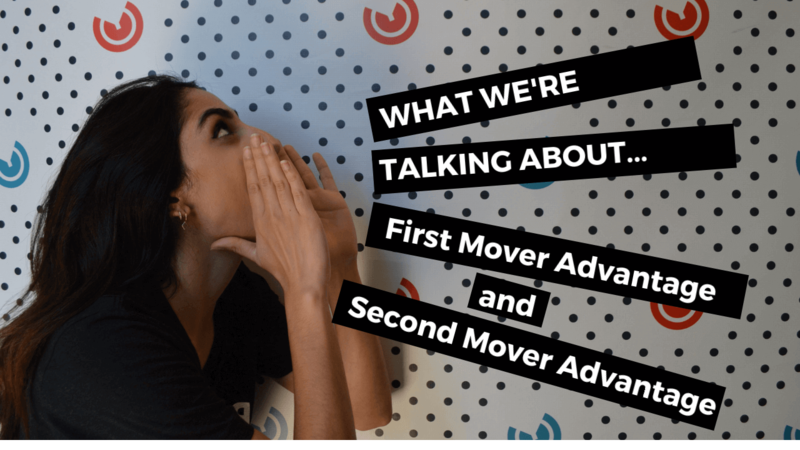 What Are the Advantages of First Mover Advantage? There are a number of advantages when being a first mover, and this article, that comes to us from Corporate Finance Institute, explains a few of those in as simple terms as possible. Your brand, product and/or service becomes the industry standard when you have first mover advantage. Since you're the first company supplying a type of product or service, your brand recognition will be greater, and thus, you are more likely to gain loyal customers. On top of that, having control of resources, such as contracts with top suppliers and hiring the best employees, is surely an advantage. Then, you can look at it from a buyer's perspective, as well, and acknowledge that for them to switch brands will cost them more, So, why would they? Now, being a first mover doesn't mean you'll always be on top in your marketplace. It means that you're the first to succeed in it. So, make sure you take advantage of this as a first mover, so that competitors don't dethrone you and become the new industry titan. What better way to understand how to be a top performing business with first mover advantage than by looking at companies that successfully achieved this goal in the past. Brought to us by Dan Tyre from HubSpot, you can delve into 7 case studies that examine how these successful companies reached the point of first-mover success, but for all intents and purposes, Amazon is going to be our focus here. Other than Amazon, of the 7 companies he lists in the article, there's eBay. If you know the history between eBay and Amazon, you'd know they have been in direct competition in the past. This is because, eBay, the world's largest online auction site, withstood Amazon's efforts to encroach on their market with their campaign, Amazon Auction. Amazon became a giant in its own right, owing their success to being the first major online bookseller, forcing out longtime “brick-and-mortar” setups like Barnes & Noble. They went on to see even greater success, poaching the eCommerce market with their online store, Amazon.com. Also on this list, Kindle, whose parent company is Amazon, again beat Barnes & Noble to the punchline of success by introducing e-reading in 2007. So, as you can see, Amazon - who is and isn't a first-mover - identified and acted on many different market opportunities to reach the height of where they are now, though not all attempts they made worked out as they would've liked. The same goes for YOU, or any first-mover or follower. Succeeding through innovative, yet researched methods, sales and marketing strategies is key. Using game theory, Geoff Riley goes over 4 scenarios in this short video clip where two firms, Firm A and Firm B, comparatively price products, assuming they've the same quantity of product. When Firm A prices their product high, and Firm B prices their product low, Firm A will receive negative return. The same scenario applies when Firm A and B flip their prices. Now, when Firm A and B equally price high, they both receive higher return for their products, and the same applies when they equally price low, though they make less profit. What does this teach us then? Well, when competing against direct competitors, you'll want to analyze how much you should be pricing your product relative to how much of it you own. Competing companies can become second-movers, learning from your mistakes - so, learn from your mistakes before they do, eliminating any chance of vulnerability. If You Don't Have First Mover Advantage, Here's How to Succeed without It. We know the lot of you aren't first-movers, unfortunately! So, how can you succeed when a marketplace is dominated by first-movers? Well, success in this case mostly relies on learning from first mover's mistakes, as we somewhat previously pointed out. They don't know if the product even solves a worthwhile problem. Learning how to succeed in a marketplace when you are a second-mover relies on understanding these problems that first-movers face. Procurement - In a new market, first-mover competitors have already educated your target audience, but you can still expand on that, offering even more valuable insights into your more highly designed product than theirs. Mimicking can still result in achievement and ultimately requires much less effort to do than starting a business with a new sales and marketing strategy from scratch. Now, if you are a first mover, we wish you luck! But, if you aren't and would still like to succeed in your market, we hope you learn from your own mistakes and the mistakes of your direct competitors. One way to ensure that your business won't fail is to proactively employ sales and marketing strategies, knowing your sales processes' ins and outs. A big challenge first movers and second movers face is knowing their target audience, and subsequently, gaining and identifying leads. We'd like to help you with that too. So, learn how to define a lead, qualify a lead and know the mechanics for generating leads by heading on over to our Introduction to Lead Generation Guide.